It's a police! It's fire siren! It's an EMS Siren! It's a motorcycle siren! It's a remote siren! NO WAIT! It's ALL OF THOSE! The most popular Carson Siren has been redesigned to offer more flexibility and super simple installation and with added functionality. Carson listened to their customers and decided that the size of a compact siren is one of the most important factors so they made it smaller. They went to work and this is the final product. 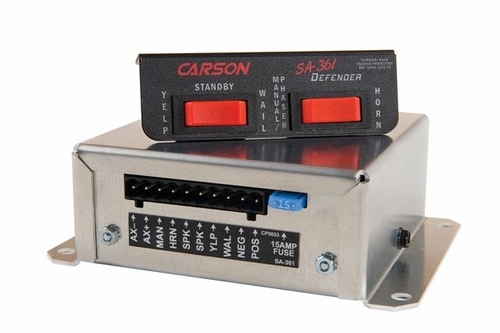 The SA-361 Defender Siren is designed to work with a single 100-watt siren speaker and includes a mounting bracket, short circuit, high voltage and reverse polarity protection systems and an output indicator light for diagnostic purposes. The remote switch panel features a pair of three position rocker switches to select between wail, yelp, Phaser or optional Two-Tone/HiLo, Manual and Air Horn siren tones. The siren also features external DIP switches for easy siren customization, and the Horn Ring Cycler 2 (HRC2) function that enables the driver hands-free control of the siren by cycling through the tones with the vehicle's horn. As with all Carson Sirens products, the SA-361 Defender is backed by a no-hassle 5-year limited warranty. The rugged SA-361 Defender remains the affordable choice for law enforcement, security, and volunteer firefighters. One of the smallest and most compact remote sirens on the market today! Output indicator light for diagnostics - that way you KNOW that it's working! Amp Size (cubic inches) 47 cu. in. 53 cu. in. 67 cu. in. 63 cu. in. First of all excellent company to purchase from. I got my order very fast with no problems. Now for the Carson SA-361 Defender, it is a excellent made in the USA siren. I paired it with Federal Signal ES100 and it screams down the highway, It's definitely an attention getter.... Moves traffic like it should. Was very affordable and easy to install. 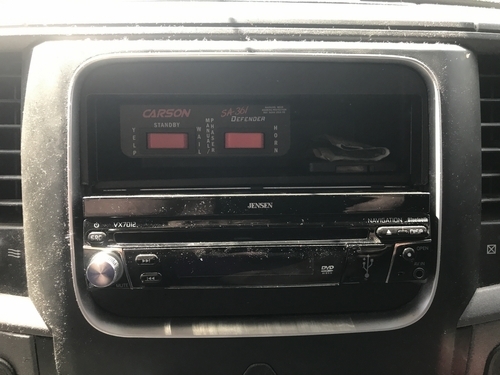 Very easy installation, really loud. I work with a volunteer fire department and we all have these. Great loud sound comes from a small box. Wires up easy. If you are worried about that - don't be they help and it's easy.